The apprehension of illegal border crossers by Border Patrol agents jumped 31 percent in May from the previous month. The jump follows a six-month decline in apprehensions after the election of President Donald Trump. The increase comes as Border Patrol agents report “catch and release” programs are quietly continuing. 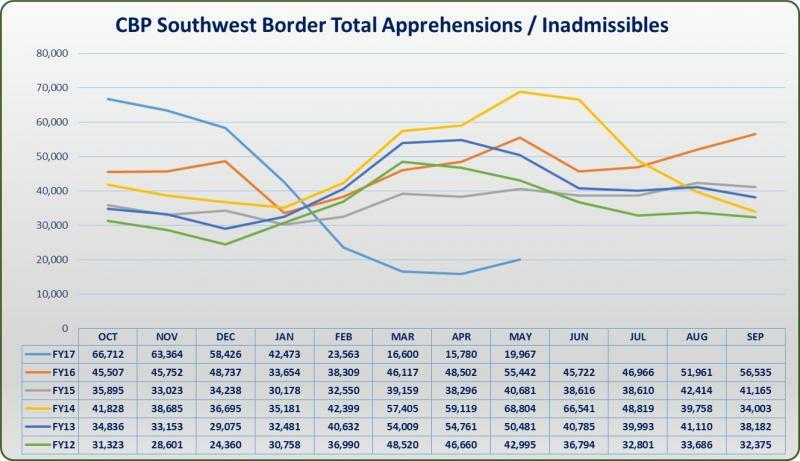 While still down significantly from the peak in October 2016, Border Patrol agents apprehended 14,535 illegal immigrants along the southwestern U.S. border with Mexico in May. That number is up from the 17-year low number of 11,126 reported in April. Since 2014, the number of apprehensions has increased from April to May. The numbers of Unaccompanied Alien Children (UAC) jumped a startling 50 percent from April to May (997 to 1,493). During the same period, Family Unit Alien (FMUA) apprehensions jumped by 41 percent from 1,118 in April to 1,577 in May. Of the nine Border Patrol sectors along the U.S. southwest border, the Rio Grande Valley (RGV) Sector continues to lead in the numbers of total apprehensions, accounting for nearly half of the 46,183 apprehensions since October 1, 2016. The next closest sector is the Tucson Sector at 5,925. 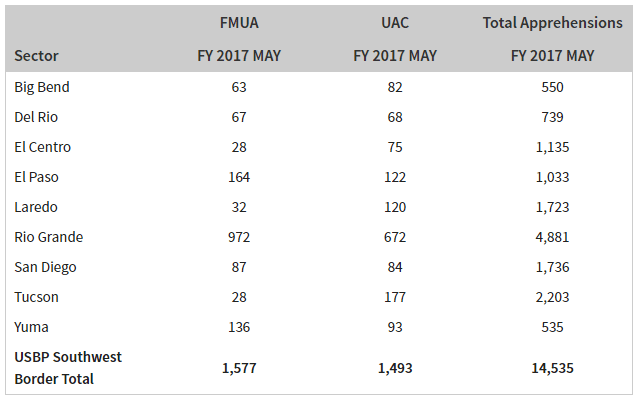 The RGV sector also leads in UAC and FMUA apprehensions. So far this year, 4,082 UACs have been apprehended in South Texas while 8,718 FMUAs were apprehended. The El Paso Sector came in second place in both UAC and FMU apprehensions (621 and 1,482 respectively). Border Patrol agents believe the resurgence can be attributed to the Trump Administration’s quiet continuation of the Obama “catch and release” program, Breitbart Texas Editor-in-Chief Brandon Darby and investigative journalist Ildefonso Ortiz reported. Agents previously expressed feeling betrayed by the new president’s administration after Homeland Security Secretary John Kelly appointed Kevin McAleenan as head of the U.S. Customs and Border Protection, the parent agency of the U.S. Border Patrol. “He nominated this guy .. the problem is that this guy was hired by Barack Obama and was made deputy of [CBP] and all of the things we fought against on the border happened under this guy’s watch and he would have been the one responsible for implementing them. That’s DACA, DAPA and Catch and Release.” Darby said in a Pursuit of Happiness interview referring to some programs started under the Obama Administration.